1. If a freaky, jaw-dropping, scary-assed series of events, such as what you describe in Wrong Place, Wrong Time had never actually happened to you, do you still think you would have written a book one day? Why or why not? Great question. I enjoy reading but this is the first piece of writing I have ever done. I was pushed by my great friend and Editor Elaine Denning to write this story, and I have the bug now! A second book, which is fiction, is in progress. 2. What is the best, or most pleasantly-surprising thing about being an author? I really do not consider myself an author, I just wrote what happened to me. But, now I have been told: "David you've written a book, so go along with being an author", which I like hearing! 3. What’s next for you as an author? Tell me all about your work in progress. I have a second book in draft. The outline of the story is there, I just need to put the story together which is what I'm doing at the moment. 4. Born in England... Headed off to Spain... Now living in Portugal... Por favor, please tell me: What draws you to the Iberian Peninsula? I just love being by the sea, and the weather. I also like mixing with the locals, and living their way of life. 5. What was the most difficult thing about writing Wrong Place, Wrong Time? Putting down the events that happened to me bought it all back. But writing the book took a huge weight of my shoulders. 6. We met each other over the Twittersphere. Obviously social media is a tremendous boon to authors. How do you reach your audience outside of Twitter? What advice do you have for other (aspiring) authors with regards to social media? Well I am new to this but my work is all about marketing. I do enjoy the marketing side of the book: Twitter, Facebook, my blog etc. There are so many aspects of marketing one can follow. In fact the book has taken over my life at the moment. It has been so busy with interviews. My advice to aspiring authors is to really focus on the marketing side even before the book is published. Create a following on Twitter, set up a Facebook page and a blog/website and keep at the marketing. It is a full time job which does play havoc with my job outside the book. Hopefully one day I can just concentrate on writing and earn a living from that. 7. Your book is available on Kindle and Amazon, and was published by CreateSpace. Obviously, there’s worldwide reach via Amazon and Kindle, but what thoughts went through your mind when you finished your manuscript and began shopping it around? Was CreateSpace always your intended publisher or did you investigate other options? After doing my homework, Amazon was the place I wanted to self-publish my book as it reached the furthest audience. That is my personal view. 8. Did your experience in Spain forever ruin Paella for you? Can you drink Sangria without having negative flashbacks? Funny! Yes I can drink Sangria anytime, no problem at all!! 9. Smaller and more independent presses give the author more control over their product and over their content, but the downside of this may mean less marketing support. What are your comments on this? Do you think this matters as much as it might have twenty years ago? My view is, it’s all about the marketing and I prefer to do the marketing myself. There are a few excellent independent presses out there who have my book on their sites, which pull in a few sales and readers. With me, I like to get my book across a whole spectrum. The more the merrier, to be honest. 10. One of the clips from a review on Amazon is: “Now just try to remember, David is a really nice guy.” Tell me: How many little old ladies have you helped across the street? What makes you such a nice guy? And what’s your opinion of the old saying: “Nice guys finish last”? People have their own views. To some I am a nice guy and to others I am a scumbag as one reviewer said. That’s the beauty of personal views. I don’t think that I will finish last, only in the 100m sprint! 11. If you were a travel agent, would you still recommend Spain to prospective travellers? What attractions in Spain are not to be missed? Of course, if someone came into my travel agency and wanted to book a holiday to Spain, then I'd yes, you must visit it. However, I haven’t been back to Spain, so I'm unsure what's new there. But I am sure the beaches are still stunning! 12. If a Hollywood hotshot showed up at your house and said he wanted to make Wrong Place, Wrong Time into a blockbuster, big-budget movie, who would you like to see cast in the starring role? I have been asked this questions a few times. I don’t know, maybe Robert Pattison? 13. Last question is a bit of a freebie: What is the one thing you wish I had asked you, but didn’t? Now go ahead and ask and answer that question. What was it like in the hotel, with fire around, plus all the smoke and saving the two lives? Answer: I was only focused on saving the two people! I felt a huge rush, and would do it again. The downside was the events that took place afterwards. 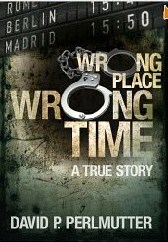 Get WRONG PLACE, WRONG TIME on Amazon. Click HERE. Thank you Jill for your time in coming up with some great questions which I loved answering. It has been a pleasure getting to know you and will be keeping an eye on this impressive blog.